China’s role in Afghanistan is constructive, but not decisive. According to recent reports, an Afghan Taliban delegation led by the leader of the group’s Qatar-based political office, Sher Mohammad Abbas Stanikzai, visited China in mid-July. After news of the secret visit became public, China’s Foreign Ministry said it maintains contact with all parties related to the Afghan peace talks, confirming — though indirectly — the visit of a Taliban delegation to Beijing last month. The Taliban’s visit to China last month was not the first such delegation sent to China in recent years. The Taliban sent a secret delegation to China and met several senior officials in Beijing at the end of 2014. In May 2015, China organized a secret meeting between the Taliban and the Afghan government in Urumqi, the capital city of China’s Xinjiang Province. The timing of the Taliban’s recent visit to China is unique, however. On the one hand, the new Taliban leader, Haibatullah Akhundzada, took the highest position inside the Taliban less than two months ago. As a result, China could further its own understanding about the newest changes inside the Taliban via this meeting. On the other hand, this was the first time that Abbas Stanikzai has led a delegation to China since he became the director of the Taliban’s political office in Qatar in August 2015, when Akhundzada’s predecessor, Mullah Akhtar Mansour, took power. The visit by the Taliban delegation to China was an important chance for both China and the Taliban to further mutual understanding. The secret communication between China and the Taliban, or other Islamic extremist groups, could be traced back to the 1980s, when Islamic militants from all around the world resisted the USSR’s invasion of Afghanistan. China’s former special envoy for Afghanistan, Ambassador Sun Yuxi, started to get involved in the Afghan issue as a young diplomat in 1981, when he helped provide Chinese arms to the Afghan mujahideen fighting the Soviets. In the very early stage of Taliban rule in Afghanistan, China hoped to develop a relationship with the Taliban government and to get a promise from the Taliban not to assist or support the “East Turkestan Islamic Movement” (ETIM) or other Islamic extremist groups that aimed to target China inside Afghanistan. In return, China promised to back the Taliban government in various international organizations such as the UN, and to recognize the legitimacy of the Taliban government. China’s ambassador to Pakistan, Lu Shulin, became the first senior representative of a non-Muslim state to meet with Taliban leader Mullah Omar. However, the meeting was not fruitful. This led China to distance itself from the Taliban regime and cut ties with Afghanistan. Although Chinese companies such as Metallurgical Corporation of China, Jiangxi Copper Corporation, and China National Petroleum Corporation have made huge investments in Afghanistan’s resources, China’s major concern in Afghanistan is largely based on security threats that may radicalize Xinjiang, where many members of the Uyghur Muslim minority group are located. China believes Xinjiang is particularly vulnerable to the “spillover“ of terrorism and extremism from Afghanistan. 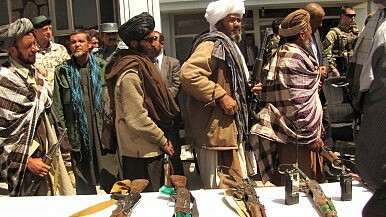 From the mid-1990s to 2001, ETIM was permitted by the Taliban to set up training camps in Afghanistan. The Afghanistan-Xinjiang security nexus is seen by China in particular in the close linkage between the Taliban, al-Qaeda, and the newly emerged Islamic State with Uyghur terrorist groups. China’s “special constructive role” is realized in two ways. On the one hand, China hoped to help settle the Afghanistan crisis through aid. China’s support for Afghanistan has clearly grown. Between 2001 and 2013, China provided a total of nearly $250 million in humanitarian aid and trained more than 1,000 professionals. However, in 2014 alone, China provided $75 million of humanitarian aid, and promised to provide another $330 million over the next three years — more than China had provided in the preceding 14 years combined. On the other hand, China views international organizations as important platforms to diminish international suspicions toward China. China encourages Afghanistan to join regional and international organizations led by China, such as the Shanghai Cooperation Organization. China also provides economic investment to various states, including Afghanistan, under the framework of international organizations, such as the Asian Infrastructure Investment Bank (AIIB) and the Silk Road Fund. With China’s help, Afghanistan has become an “observer” state in the SCO. Meanwhile, China has maintained close communication over Afghan issues with regional and global powers such as Pakistan, India, Iran, Russia, and the United States. Several trilateral mechanisms have been established. China also tries to act as mediator for talks over the peace process between the Taliban and the Afghan government, though it should be noted that China pursues an “Afghan-led and Afghan-owned” peace process. China believes it is in a good position to undertake such mediation, because it has a relatively good political image in Afghanistan, as it consistently promotes Afghan-led and Afghan-owned policy, respects the country’s independence and sovereignty, and actively promotes political reconciliation there. Furthermore, China did not participate in the Afghan war that began in 2001, has not aroused the dislike of any political faction, and is relatively easily accepted by all. However, China’s role in Afghanistan is still weak and its self-identified “constructive role” is far from enough to bridge the gap between the Afghan government and the Taliban. The “constructive role” in diplomacy means it’s difficult for China to direct the peace process in Afghanistan. China mainly relies on Pakistan to facilitate meetings between the Afghan government and the Taliban. Given their close relationship — Pakistan’s nickname in China is “all-weather friend” — China can exert more influence on Pakistan than other states. But, at least to some extent, Pakistan’s intricate relationship with the Taliban is one of the main reasons for Afghanistan’s current predicament. Wang Jin is a PhD Candidate at the School of Political Science, University of Haifa, Israel.